Happy New Year! I'm taking a breather to reflect on 2016...feeling overwhelmingly grateful for my story, the happiness and hardships of the year, the gift of music and the gift of creativity, the gift of family (including my first-class parents, my Gateway Church world and my newfound blogging friends), and ultimately the gift of salvation through Jesus Christ. Thank YOU for following my journey and being part of my story...the one I believe God is writing...here's to a crispy NEW page. Travel made up a big portion of my year and I had a blast looking back through the photos, stories and adventures of 2016. Click here to review my travel diaries from 2016! This year began with making new California memories, so what better way to kick things off than this West Coast shoot?! Big Sur, CA is one of the most stunning places I've ever visited (see my photo diaries and vlog from my previous trip) and I feel grateful to have made it back again for more exploring. Below, I'm doing a little Q&A about 2016/2017 and I'm also asking YOU a few questions in my reader review (yep, it's anonymous). Please click here and take a minute to fill it out...I'd absolutely love to have your input on the blog as I plan content for the New Year! 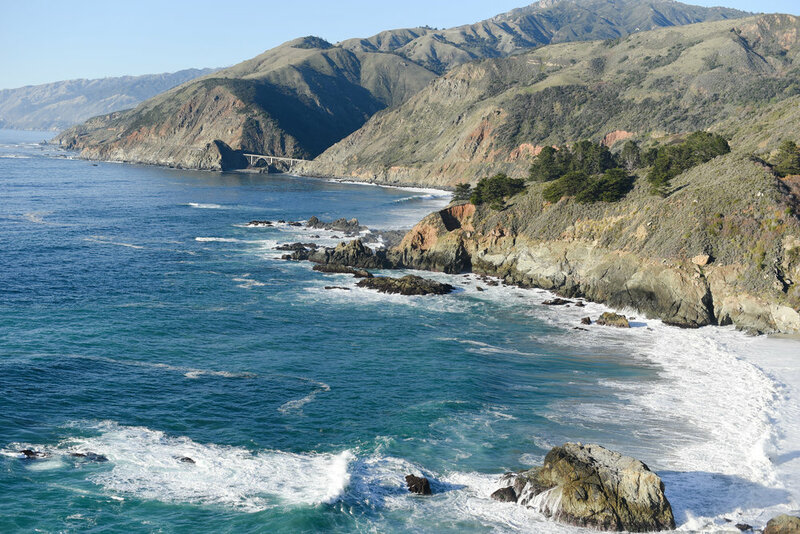 Q: Why is 2017 more epic than Big Sur? Q: Fess up! How many days did you spend in California in 2016? A: Do you really want to know? 26. Q: What’s one trip you hope to take this year? A: Just one?! I’d love to go to NYC for NYFW with a few of my blogger friends! Q: What’s a purchase you’d like to make in 2017? A: A legit bedroom vanity would be so awesome, along with a new full-length mirror. I also want to finish decorating my work office, set up a home office, and purchase a studio photography lighting rig! Q: What’s the best lesson you learned in 2016? A: Sleep is not overrated. Q: What are a few of your focuses for 2017? A: Learn, grow, flourish, anticipate, relax, enjoy, dream, believe, repeat. Q: Blog goals this year? A: Of course, I have the longest list! :) But the most important to me is that I want more people to see my blog. Not because I think it's the best blog since sliced bread, but because I’m passionate about it and want more people to have the opportunity to enjoy it as much as I do. I love people more than I like my blog and each person who visits the pages of my life represents their own story, set of experiences, perspectives, difficulties and dreams. My desire is to be a source of encouragement, hope and inspiration to anyone who steps foot onto my digital space, whether it be for one visit or a daily check-in. Q: What’s one superhero power you wish you could have this year? A: Pausing time and multiplying it! I also wish I could multiply my multitasking ability by 100%. Remember to take my reader review! Here's to a fabulous 2017!! !